Music and singing is my passion and has been an important part of my life from a very early age. My hobbies/interests are varied and include singing, music, sewing, knitting, cooking, reading and I belong to two ukulele groups in Tauranga. A group of us, periodically entertain the residents of the local Rest Homes etc., on an informal basis. Past/previous voluntary work has been, Radio Operator Tauranga Coastguard, Grief Support, Victim Support, Waipuna Hospice. Work history was in the field of Credit Management. I have four daughters and son-in-laws (all live locally), eleven grandies and two great grandies makes for a busy family life and I feel truly blessed. 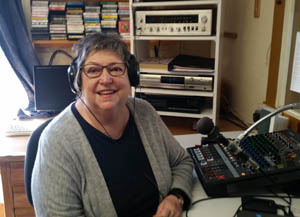 I enjoy compiling programmes and playing music for our Village Radio listeners each Tuesday and look forward to sharing my passion and nostalgia with you all on a regular basis.